I had a grand time in 2014 visiting the Dowdy Ranch entrance to Henry Coe State Park on multiple occasions. The eastern half of this large park, the second largest in the state system, is very remote and difficult to reach for day hikes when the Dowdy entrance is closed, which is most of the time. Budget cuts have kept the entrance closed longer than usual this year and the new schedule has it open only two and a half days around the weekend. The signs along SR152 still say "Closed for the Season", perhaps as a deterrent to keep visitors away. I had been looking forward to another visit this year to tag Mustang Peak and a few others on a long bike ride, but that may not happen since most of my free time is during the week and with summer approaching the park is usually too hot. I had reserved Wednesday for a visit to the park before I had learned about the restricted opening. Rather than simply cancel, I decided to pay a visit to a few minor peaks in the same area. These two summits are found near Bell Station, on either side of the Kaiser-Aetna Rd at the Dowdy Ranch entrance. I parked at the old gravel lot behind the abandoned mobile office that used to serve for the park's ranger and visitor center before the permanent center was built at Dowdy Ranch inside the park. This lot appears abandoned too, with little maintenance these days. I've never seen another car use it and with good reason - when the gate is closed, it's a 7mi haul on foot or by bike to reach Dowdy Ranch. Come to think of it, I'm not even sure why this parking lot was even built unless it was to facilitate carpooling in on the dusty dirt road. Land on either side of the road is private for the entire 7mi stretch. Numerous signs make this abundantly clear and parking is not allowed on the road until Dowdy Ranch is reached. As I started up the road on foot my only concern would be getting seen once I left the road by one of the private landholders, mostly ranchers, driving in to attend to ranch duties. Luckily there were only short stretches were I was likely to be noticed - when I first left the road, when I crossed back over the road at the top of the loop, and when returning to the road at the end. Leaving the road proved easy - I dropped into a small culvert on the left side and started hiking up the other side in a broad drainage. Large oaks would provide cover for most of the hike up to the ridge and within a few minutes my chances of being seen had dropped to some low value just above zero. The hike was a pleasant one, the weather overcast, chilly and a bit windy, the terrain oak-studded grass slopesl with only modest chaparral cover. 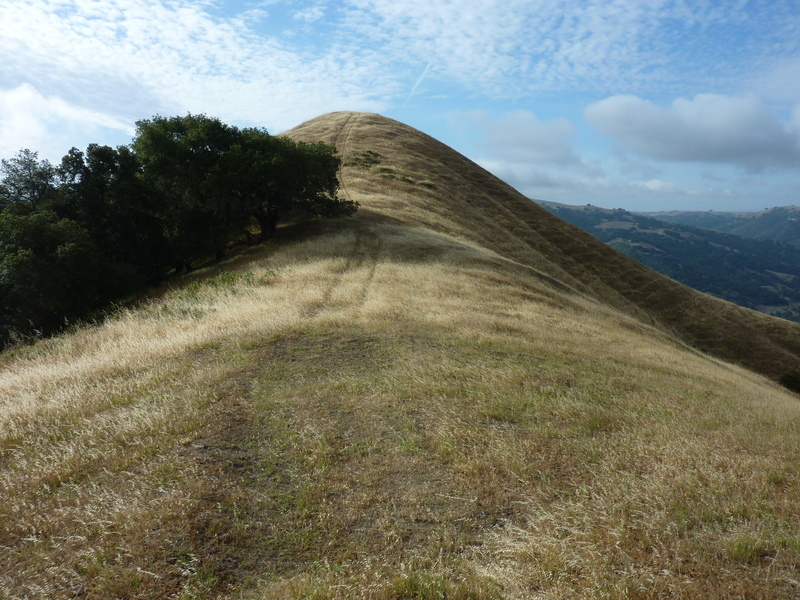 The cattle had grazed most of the hillsides to within a few inches of bare earth, making the hiking fairly easy. Once on the ridge I was treated to nice views overlooking the SR152 corridor behind me to the south. To the east was the ever-so-slightly higher Peak 1,442ft and to the west the familiar shape of Elephant Head (which doesn't look at all like a pachyderm, btw). I went up and over the rounded summit, descending the north side and then following the ridge along a cowtrack, eventually reaching the main road where it tops out after a steep climb from the canyon below. I hurriedly crossed the road, took a picture of a roadside lake and worked my way east along little-used ranch roads towards Peak 1,442ft. I relaxed once more a few minutes later when I was out of direct view from the road and had climbed higher. I came across some grazing cattle on this side of the road, most of which chose to simply watch me before going back to their breakfast, a few finding a little morning exercise and some distance between us preferrable. I found a few large oaks atop the summit with wide-reaching views. Pacheco Peak was a notable pointy figure standing out in the skyline to the south, Lakeview Peak to the north. I continued my looping route, descending the ridge south from Peak 1,442ft. I stopped suddenly when I noted a truck stbelow near the entrance. Guessing it was stopped there to open and close the gate, I waited patiently under cover of an oak for it to finish its business and start up the road before I continued my descent. This last segment went rather quickly, taking but ten minutes from the time I spotted the truck until I was again back at the parking lot. I covered a little over 4mi in about an hour and a half, a very nice little loop. There had been some poison oak along the route, all of it easy to spot and avoid. This would probably have made for a nice moonlight hike as well. I next drove up to Pacheco Pass and the state park found there of the same name. The highpoint of the park is Spikes Peak which I had visited previously, but there were two unnamed summits just outside the park boundaries that I was interested in. The first of these, Peak 1,721ft is located just outside the southern boundary on the eastern half of the park. This part of the park overlooks the San Luis Reservoir and has been leased to a windfarm corporation which has put up around 100 towers at this high wind site. The park lands, part of the original Mexican land grant given to Francisco Pacheco and his son Juan in 1843, was donated in 1992 by the fifth generation heir to the state to be used for "future generations who share her love of animals, horse back riding, history, and unspoiled lands". Sometime after that the state deemed it a swell idea to hand over half of the land to build a wind farm. While I'm not a big fan of wind farms, this one particularly frosts me because, as I came to find out, half of the park is closed to public use. From the Wikipedia entry: The eastern two-thirds of the park are closed due to an underdeveloped trail system and safety concerns over the numerous wind turbines in the area. The windfarm access roads, most of them old ranch roads, make fine trails, so I found the first reason BS. Are they afraid the turbine blades are going to fall off and kill someone? Are they afraid the towers will be vandalized? Neither of those seem likely. The most likely concern is for an accident involving one of the corporation trucks and a member of the public. Slow speed limits could help that, but instead we have this land donated for public use and then closed off so that a windfarm can be operated on it. Nice. Not that this would stop me. I parked outside the park off the paved road leading down to a boat ramp on the west side of San Luis Reservoir. This made the ride slightly shorter with the added benefit of saving the $10 daily use fee. I lifted the bike over the tall gate found here and was soon on the windfarm road. I initially followed the trail signs for a single track trail that paralleled the road. Nice for hiking or equestrians, the tall grass that overgrew the trail made me nervous, wondering if I was about to crash into an unseen rock and fly over the handlebars. Where the trail turned right and away from the windfarm I returned to the forbidden road. I soon found myself approaching a field office composed of 2-3 trailers with several trucks parked outside. I rode silently by, glad I didn't have a voice yelling behind me, "Hey! Come back!" I kept wondering if I might still be spotted and a truck sent after me, or perhaps be confronted by a truck out working on/inspecting the towers, but I saw nary a person during the entire visit. It was actually a very nice road to ride on with gentle grades and hardpacked gravel and dirt surfaces. I rode under and past numerous turbines, humming away at a brisk pace. It was very windy and cold, prompting me to put on fleece and gloves to ward off the chill. In late spring and summer it can be brutally hot here, but today it was more like winter. Consistently high winds of course were the reason that the place was chosen for a windfarm. I spent about 35min riding 4.5mi to the park boundary. I expected this to be a pretty remote location and little visited, but found otherwise. 1/3mi beyond the gate was a ranch complex with several large wooden buildings and a number of large holding areas for cattle. Just below this to the east lies a ranch home, of newer construction and evidently occupied. The windmill road is the only access road for this ranch. After locking my bike to the fence and hopping the gate I started walking down the road but quickly thought better of it when I spied the home. Back over the fence I went. I decided on a cross-country route that skirts the park boundary and away from the ranch facilities to get me to top of Peak 1,721ft, about a mile to the west. This worked nicely, taking about a half an hour, seeing me to the summit without incident. The only detraction was the number of stickers and thistles that attacked my shoes, stabbing my feet with a hundred pinpricks. By the time I reached the top I was in some discomfort and had to stop and spend about 20min to remove all the stickers from my shoes and socks. I sat on a rock just below the summit while I did this, enjoying the nice views around me (Mt. Ararat to the south, Pacheco Peak to the west, Basalt Hill and the reservoir to the east). I had been to all of these named summits and more over the years and was happy to see them looking as pristine and untrammeled as ever (never mind that both Basalt Hill and Pacheco sport several towers each). I returned to the bike via the same route, repeating the pause to remove those pesky stickers once more (for which reason I would have to recommend winter or early spring for a visit). Another 30min saw me back to the pavement where I'd left the van. I had intended to visit a second summit in the area, off Whiskey Hill Rd at the west end of the park, but found my motivation lacking. The wind had been just too strong to really enjoy the outing as much as I'd have liked and it seemed like a better idea to leave it for a less windy day in the future.